The well-regarded leaker IceUniverse has posted an image showing a phone with Samsung flagship-like design hallmarks. 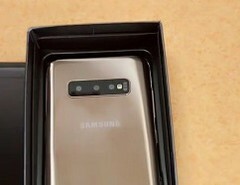 The tipster asserts that it is a Galaxy S10 clone. If so, it suggests that the makers of fake phones think that the device will strongly resemble the Note 9. The Samsung Galaxy S10 is most likely still a few months away from launch. Therefore, it is now the season of leaks and rumors concerning this phone. This process often includes the release of clones, or smartphones that are (ideally) sold as off-brand flagship replicas. They are often available long before the 'real' device comes out, and are designed based on material such as case and industrial design leaks. The Twitter leaker IceUniverse claims to have found such a clone based on the Galaxy S10. Some clone phones can be more or less convincing compared to the real thing. If the makers of a clone found by IceUniverse are to be believed, the S10 will continue the horizontal orientation in which the rear cameras of Samsung devices are often found in. The most recent example of this is in the Note 9. The clone, however, exhibits triple rear cameras, which lines up with some previous leaks about the phone. The rear-facing fingerprint reader, which was switched to a central position underneath the camera strip in the Note 9, is also absent from the putative S10 clone. This suggests a corroboration of the theory that the upcoming flagship will incorporate an in-display fingerprint sensor. This could be an optical module, as in the OnePlus 6T - or a more novel ultrasonic scanner. The 'S10 clone' has a shiny, dark-gold-ish finish. This, however, could mean nothing in terms of actual Samsung SKUs, as clone phones can be inaccurate in terms of device color. IceUniverse has asserted that the clone is made of plastic, which, with Samsung's history with premium materials, is probably not a choice for the real thing.